Have you been living without a full set of teeth? If so, then you’re quite familiar with the host of inconveniences that come along with that. You’ve lost the ability to eat many of the foods you love. Your confidence has waned, and even pronunciation has become difficult. Still, there are more concerning problems, which you’ll learn about as you read on. You’ll also discover how dental implants in Richardson help to prevent these issues and leave you fully restored. Your teeth are held in place by roots that attach to the underlying jawbone. When they are dissolved due to decay or disease, your teeth eventually fall out. The dental implant mimics the function of the roots by being surgically inserted into your jawbone. Made from titanium – a biocompatible material – the post fuses with your existing bone and forms a sturdy foundation that an abutment (anchor) and permanent fixture (crown, bridge or implant-supported denture) can be attached to. Not only does this process rectify the previously mentioned problems, it also prevents other issues from fully manifesting. Bone Loss – Your teeth work in unison to produce a healthy amount of tension as they gently press against each other. This tension sends a signal to the jawbone to continue producing new bone cells. When there is a prolonged loss of teeth, though, the natural balance is thrown off, which slows down or stops the production of new bone mass. Premature Wrinkling – The amount of skin covering your face is created to perfectly accommodate a full set of teeth. Thus, another downside of prolonged missing teeth is that the facial skin is left loose from the lack of necessary tension to keep it taught. The result is premature wrinkling. Facial Collapse – Along with premature wrinkling, the loss of bone mass eventually leads to facial collapse. When this happens, the entire facial structure changes and shifts. This can lead to problems elsewhere in the body like back pain as the shifting causes alignment issues. 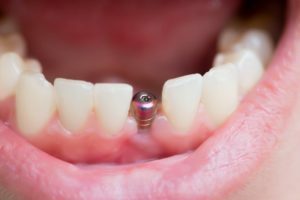 Although dental implants will prevent the above maladies, there is a window of opportunity that must be taken advantage of. The longer you wait, the more bone loss that occurs, which can make the implant procedure more difficult. Thus, if you’re suffering from lost teeth, don’t hesitate to reach out to your dentist in Richardson to get the help you need today. For over 20 years, Dr. Afshin Azmoodeh has been a fixture in the Richardson community. Still, the Texas A&M graduate strives to broaden his knowledge and expand his skillset through continuing education. Dr. Azmoodeh helps patients regain the lives they once had and prevent other oral problems with dental implants. He practices at Canyon Creek Family Dentistry and can be reached for more information through his website.